Dr. Massachi made me feel very comfortable. His nurse was very sweet and welcoming. He addressed all my concerns, except I think he forgot to give me a throat specialist that I asked for ( I will just follow up when I ask for my blood test results). Such a pleasant experience all the way around. 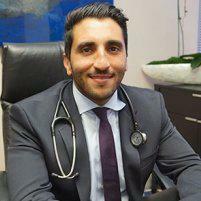 Dr. Massachi is very compassionate, interested and extremely knowledgable. The consultation was thorough and he had great questions and advice. The staff was kind and attentive. I got referred to all the doctors Immediately that Dr. Massachi thought could help me. The offices are nice. And no wait! I get that Dr. Massachi likes to run a tight ship and on time. Very considerate. A+++ service. Awesome doctor who genuinely cares for his patients. It was my first visit for my annual checkup and I was surprised at how thorough and quick the appointment went! The whole staff was professional and knowledgeable, I feel I can trust them with my well being. Dr. Massachi is very accommodating and makes himself available when in need. I would recommend him for those seeking a new primary physician. It was my first visit, and I was very impressed. It was obvious that Dr. Massachi cares and is very knowledgeable. The office pays attention to the little details, which I like. Overall great experience. Friendly staff. Dr. Massachi really cares about his patients. No waiting forever when I come here. Fast, professional staff. Dr. Masachi is always friendly & thorough. Very compassionate and thorough. The staff was friendly to work with. Friendly, knowledgeable, and helpful staff made my visit as brief and enjoyable as possible. Very impressive facility including everything needed. Sr Sasan is very thorough and caring professional. Dr. Massachi is very down to earth and patient. He spent a good amount of time with me, answering my questions, talking about the fundamentals of lifestyle, nutrition and wellness which meant a lot to me! Dr. Massachi was incredibly patient and helpful with all of my concerns. Would definitely recommend him to anyone looking for an internist. Scheduled for an annual physical. I received a very thorough exam. I was very impressed by the top notch facility, attentiveness and overalll care. Dr Massachi was the one who greeted me and took me to his office which I have never experienced at any physicians office. It was so refreshing and it felt like I was being cared for in a unique way; not just another patient. His bedside manner and gentleness put me at ease. All the staff from check in to nursing were kind and helpful. Thank you! Will definitely refer friends and family to the office. Best doctor experience I've ever had. Very personable and interested in how I'm doing apart from what I'm coming in for. Will use his services as long as I'm here in LA.